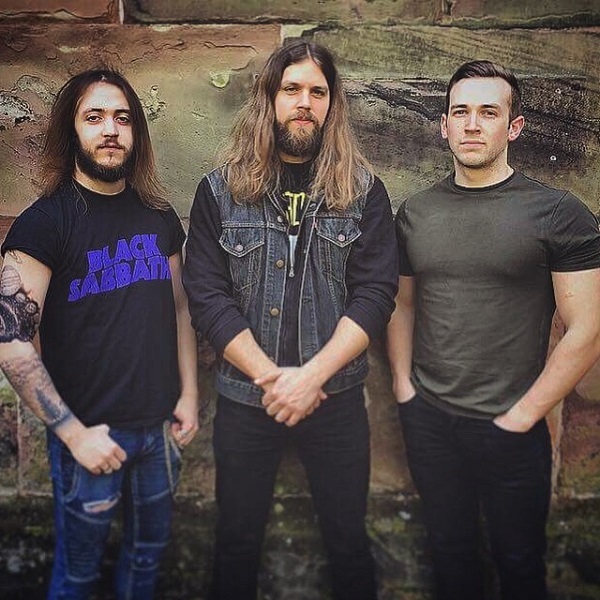 Hailing from Staffordshire, three piece band Obey are currently in their tenth year and have over time amassed a very decent sized following wherever they play. 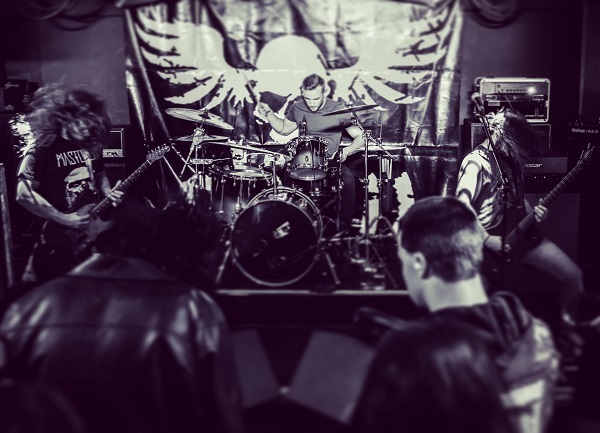 Winning awards including Metal to the Masses in 2015, Obey just want to play their rock and doom influenced tunes live and have played everywhere from their local pub to Bloodstock. Obey are about to release their third album in the Spring of 2019 and I thought now would be a good time to get in touch with the band. Here we find out how Obey songs are constructed, their desire to play live and the struggles bands have to face nowadays. A very interesting read and I thank and wish the band the best of luck for their future. All of us are from Stoke-on-Trent, born and bred. The current line up has been playing for slightly over 6 months now, but Obey was formed way back in the fall of 2008. Big slices of doom filled riff pie with sprinklings of proggy other-worldliness. Writing for ourselves and not following other trends is probably what makes our music unique. Obey have released two albums. How does it feel to put all your blood, sweat and tears and get an album out there? Ah! There’s a cheeky third album a fair few of our listeners know about, released alongside Obey’s inception, being New Day Rising. It’s quite simple really; worth it. To sit down and get all of our tracks recorded is incredible! And all of us can’t wait to watch our hard work pay off in the new year! You have recently completed recording your third album. What can you tell us about it and how would you say the sound is compared to that of your debut album? Albums are a statement as to where a band are at that particular moment in time, so the new material is very different to our debut as we’ve all developed as musicians and our tastes and lives have changed so much since. But there’s always going to be the heavy groove filled element. That’s been there since the start. We suppose it’s to compare what we are doing now to our last album Maelstrom which was a real turning point for us sonically. It was on Maelstrom that we really brought in the progressive Mastodon-esque vibe that we openly admit we’re heavily influenced by. On the new album we’ve continued to expand on that but we would say that the new songs are as a whole a bit more immediate and groove driven. This time as with the last, we are using the same team, and said team consists of the single genius that is Sam Bloor of Lower Lane Studios right here in Stoke-on-Trent. Sam did an overwhelming job for us with Maelstrom, and now we trust that his wealth of experience will result in our finest album yet. Sam has done everything for us; Recording, Producing, Mixing and he’ll Master the album as well! You are very active on the live front, from local pubs and clubs to having played one of the biggest festivals the UK has to offer in Bloodstock. What should we expect from a live show, and how was the experience of playing in front of a huge crowd at Bloodstock for the band? A live show from us will net you a whole plethora of hoRIFFic songs from our discography, plus a few covers in our hometown for those wonderful fans that have been with us throughout our journey, and obviously, we three throwing some nasty shapes up on the stage. Bloodstock was Supreme. We absolutely can’t wait to get back there and play some face ripping new material and show off everything new and improved Obey has to offer! What are the lyrical themes for the new album? Is there a main lyricist? Lyrically the new material is a lot more personal than previously, touching on dementia and the things life throws at you as you get older. But we think it’s important to leave the lyrics fairly open to interpretation for the listener. The shouting master for the album is lead guitarist Steve, and has been since the start of the band. How often is the band able to get together and rehearse? Where do you get together to record? Rehearsals and writing sessions are fairly regular for us, being once a week or sometimes more. The current space we use is Riff Factory in Longton, however, one of us is in the process of constructing a personal space we can get even wilder with! How are the songs constructed in the studio? Are there the main songwriters of songs that take care of everything or is Obey a band where all members contribute to the songs? All of us get stuck right in with the recording aspect, each taking the parts that we personally perform live, Steve on lead guitar and vocals, Dan on rhythm guitar and bass, and Ryan sees to bashing the hell out of anything round and skin covered. This way we can faithfully replicate what you’ll hear on the album when we grace the stage. Being a three piece and having different musical influences within the band, is there sometimes a lot of negotiating in the studio, or do you feel you are writing music for the band? Anything we decide to jam and play around with is taken into consideration when we write. Overall it’s more of a positive thing that we all have some similar and different influences, as that’s going to contribute to our sound and let our personal touches define the band itself. By the time we get into the studio, we have already rehearsed and played the songs live, to get a feel for them in both environments. Any changes thereafter only help increase how utterly filthy the end product will be! In all fairness, it’s not too bad in the balancing act. Sure there are times where we just think “This job is going straight out of the window the next chance I get”, but, fortunately, the band for us is the sweet release of all that tension and emotion, and its the best kind of stress reliever on the planet! Do you have plans to go on bigger tours and further afield in 2018/19? Of course! We’d love to play our music as regularly as possible. We love playing as much as the crowd love seeing it, and expanding our fan base and gig list would be immense! So what are your plans for the rest of 2018? Plans thus far are to ensure our new album is sonically perfected for a release next year, get out on the road to smash out our new material, and quite possibly get prepared to shoot ourselves some music videos! How hard is it for a metal band like Obey to survive in the current climate where bands have to tour non stop and sell merchandise in order to bring money back into the band? After all of that, we are still a band that puts our music at the forefront of what we’re about. We love it when we see our shirts and merchandise out and about, and all the pennies go towards our new releases, but when all things are said and done, it’s the music that keeps the ball rolling for us and the fans, so we’re saying it’s our passion for what we do that keeps us going. Being from Staffordshire, are there any other bands from your local scene that you would recommend? An obvious one for us would be our friends in Red Spektor. Three genuinely nice guys, cracking sense of style, and some thick seventies-esque stoner rock grooves. A fun question to end this interview. If you were a DJ and were allowed to bring 5 CD’s to the party what would they be? Steve: White Zombie – Astro Creep 2000, Black Sabbath – Sabotage, Mastodon – The Hunter, Clutch – Earth Rocker and Thin Lizzy – Live and Dangerous. Dan: Well firstly, it’d be vinyls for me… and they’d be: Mastodon – Crack the Skye, Opeth – Watershed, Audioslave – Audioslave, Black Sabbath – Masters of Reality, Stevie Wonder – Talking Book and Pantera – Far Beyond Driven. Ryan: 2 Lamb of God Albums – Wrath and Sacrament, Metallica – Hardwired to Self Destruct, Sylosis – Edge of the Earth and Audioslave – Audioslave. Any last messages for our readers here at Moshville Times? Yeah! We look forward to seeing you all at one of our shows near you, so keep an eye open for our next appearance, and an ear open for when we hit the stage!